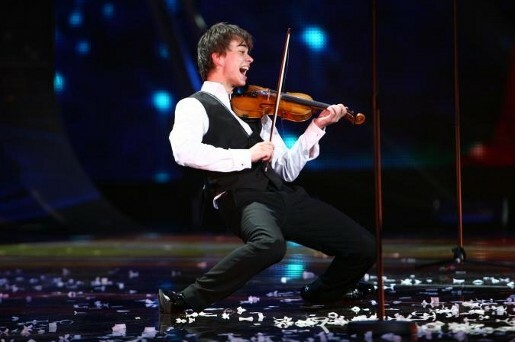 Norwegian singer and violinist Alexander Rybak has won the Eurovision song contest with an original song, “Fairytale”, performed on stage with FRIKAR dance company. The Eurovision Song Contest, held this year in Moscow, is an annual competition held among active member countries of the European Broadcasting Union (EBU). Rybak’s song was chosen by popular vote and national juries throughout 42 participating countries, winning with 387 points, the highest total score in Eurovision history. The song also won by the largest winning margin on record (169 points). Alexander Rybak was born in Minsk, Belarus, but grew up at Nesodden just outside the Norwegian capital Oslo. He has played violin and piano since he was five years old, he also composes his own music and sings. Alexander has performed with artists like Arve Tellefsen, Morten Harket, Hanne Krogh and Knutsen & Ludvigsen. In 2006 Alexander won the Norwegian talentshow Kjempesjansen with his own song Foolin. Alexander has performed with one of the world’s most celebrated violinists, Pinchas Zukerman, he has won Anders Jahres Culture Price and he’s been the concertmaster for Norway’s largest symphony orchestra for youths, Ung Symfoni, in Bergen. He also played the role of the fiddler in Fiddler On The Roof at Oslo Nye Theatre (2007) and has a role in the forthcoming movie Yohan – Child Wanderer (August 2009).